Rand and I got up early today and went to the Mission for some coffee and doughnuts. After reading about Dynamo Doughnuts--and being a doughnut lover--I decided, with Rand's prodding, that it was time to visit this new doughnuttery. My impressions: first, it's the Mission. I'm not the biggest fan of the Mish, but it has its charms. One of the best things about the Mission is that it's generally economical (with pockets of growing gentrification). Dynamo definitely fits into this latter category. Two doughnuts and two mochas came to a grand total of $13. That's pretty steep for this neighborhood. 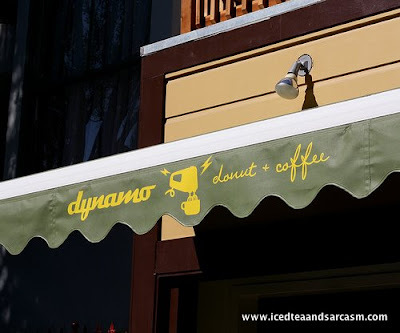 Walking up to Dynamo, one would barely be able to tell they were known for their doughnuts. The pastries are instead kept on some little displays (like cake plates) near the register. Hmmm, I thought. What a strange way to advertise your wares. Now, the flavors seemed interesting. Before going, I had read about the Maple Bacon doughnut. Yum. Alas, it wasn't too be found. Instead they had Lemon-Thyme, Chocolate Almond Rosemary, Vanilla Bean, and something else I ignored. We decided on the Lemon-Thyme and the Chocolate. The lemon doughnut was easily the better of the two. We also, as I mentioned before, ordered two mochas. Maybe it was an off day, but our mochas were bordering on bad. Mine was very hot (which is fine) and Rand's was about 30 degrees cooler. Neither had any chocolate flavor. I even added sugar to mine, but it was still bitter. I would have preferred a Starbucks mocha to this bitter swill. All in all, the doughnuts were good, but I'm not going to make a special trip again to Dynamo for them. And they either need a new barista, some better training, or new espresso.